The 2015 Honda Civic is here at Central Illinois Honda Dealers, and we know that many of you who are shopping for an affordable new compact car—coupe or sedan—likely have your eye on the new Civic. And that just makes sense; Honda’s small car has taken the lead over the competition for decades, after all. But what can you expect out of the 2015 model and its standard features? We’re glad you asked. 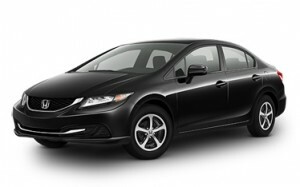 The 2015 Honda Civic is continuing to help Honda redefine the idea of “standard features,” and you’ll notice it from the entry-level LX trim. While other automakers frequently make their entry-level models the most bare bones of them all, Honda went in a very different direction: they gave drivers the high-tech amenities many of us have come to expect of modern cars. Bluetooth HandsFreeLink: Make handsfree phone calls and stream audio from your compatible smartphone. Honda’s i-MID infotainment system: Manage your technology, radio, and more from a convenient touchscreen interface built into your Civic. Standard rearview camera: Take the guesswork out of backing up, the worry out of parallel parking with this unobstructed view of what’s behind your Civic. Steering wheel-mounted controls: Manage cruise control, phone calls, and audio setting from your steering wheel; no need to take the hands from the wheel or your eyes off the road. This is just the start of the features you’ll find on the Civic LX. Now, we aren’t kidding ourselves, we know that other automakers make these amenities available—some even include a few on entry-level models—but most competing small cars have to be upgraded to be on par with the entry-level 2015 Civic. The 2015 Honda Civic isn’t just practical and fuel-efficient, it’s fun to drive. Visit a Central Illinois Honda Dealer near you and let us put you behind the wheel for a test drive; we can’t wait to see you.